if your requirement is for fast printing, in small to medium numbers, without sacrificing quality, our digital printing capability will ensure that we accomplish these print projects to your satisfaction and expectations. The digital process makes it convenient for our customers not to carry large quantities of printed materials. Instead, with quick turn-around times we are able to supply on demand, thereby allowing for efficient cash flow and as-required ordering. In addition, for many customers, it facilitates speedy updates and distribution of marketing materials and company information. Using the latest digital printing presses,Abbott & Co Printers and Packaging is confident of its capability to deliver high-resolution print output, at least on par with the quality of offset printing, so that each copy exhibits a crisp, clear image very similar to the original one. Abbott & Co Printers and Packaging has the skills, resources and expertise to accomplish the complex projects, regardless of how unique the requirements are. We are able to handle most printing projects from detailed technology and training manuals to client presentations, annual and other reports, and a wide range of marketing and promotional materials. Our fast and quality digital printing solutions will cater for your needs. We are proud to have one of the biggest digital suites in Western Australia. 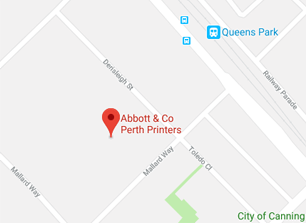 This, together with our wide range of paper options, expertise, price and service, means that our team is the name to trust for your Perth digital printing necessities. Why Choose Digital Printing Perth? Unlike with offset printing, digital printing does not require the process of creating print plates. The timely process of plate making procedure obviously adds to drastically increases cost and effort. Digital printing is more time-efficient and economical by only requiring the electronic file sent directly to our digital printing team, where Abbott & Co Printers and Packaging advanced colour management system ensures the same quality as offset print.